When you’re trying to negotiate a loan modification, you should document the entire loan modification process. Use a log to document all communications. Even people with photographic memories have a difficult time recalling everything that happened, the names of the people they spoke with, the dates of calls, who said what, what they sent, how they sent it, and so on. To improve your memory, use the following Contact Log to log everything, including phone calls you placed, phone calls you answered, items you faxed, e-mail or snail mail correspondence, notices you received, items you shipped, payments you made, and any other attempts you’ve made to cure the loan default. 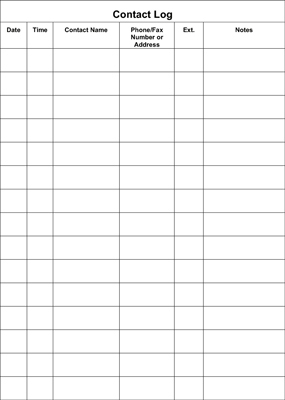 Click here to download and print this contact log. You should always verify everything your lender tells you to the greatest extent possible. For example, if your lender tells you the foreclosure sale that was scheduled has been adjourned, call your county sheriff’s office (or whoever’s in charge of foreclosure sales in your area) and confirm it. Or ask your lender to confirm the adjournment in writing (via e-mail or fax). Audio-recording your telephone conversations may seem over the top, but if it’s legal in your state, capturing your conversations on tape provides you with the most detailed and accurate account of what each party agreed to. Your local bar association should be able to tell you whether recording your own telephone conversations is legal in your state (it usually is) and admissible in court. If you can’t (or don’t want to) record your phone conversations, take detailed notes. Keep a notebook or legal pad along with a couple of pens or pencils next to your phone so you don’t have to search for them when the phone rings. After you hang up, fill in the details of what you talked about while the conversation is still fresh. If you hired professional representation, you shouldn’t be talking details directly with your lender. Anything you say may generate confusion or compromise your representative’s ability to negotiate the best arrangement on your behalf. You’re likely to be sending and receiving plenty of letters and documents throughout the loan modification process, so keep a copy of everything you send and receive. Print the date on everything you send and receive. Most people think of placing a date on outgoing correspondence, but it’s equally important to record the date you receive correspondence. Keep the envelopes you receive. Staple the envelope to the document because the postage stamp is an accurate indication of when the document was mailed. Photocopy the envelopes you use to send documents to prove that you sent them to the correct addresses. Send everything with a return receipt request, especially when you’re sending something important like your loan modification application. If you send a fax, do so from a fax machine that prints a confirmation receipt to prove it went through and was received. Print copies of any e-mail correspondence sent or received. If you’re required to send certified money, keep the check or money order stub. Create a separate file folder for all your records, and arrange documents by date. Scanning documents and storing them on your computer is fine and provides an easy way to submit documents via e-mail, but keep backup paper copies in case your computer crashes.